The E580 emulates the classic sounds of digital, BBD (bucket brigade), and tape-based delays with four parameters under voltage control. This 14hp wide Eurorack module accepts either +/-12V standard power or +/-15V MOTM/power. Using a 40MHz DSP and 24-bit codec, the E580 recreates the pitch-shift modulation of BBDs, including the variable bandwidth and noise floor, without costly and scarce BBD ICs. In Tape Mode, wow & flutter, tape saturation and non-linear distortions emulate classic tape units without the bulk and maintenance. There are two simultaneous audio outputs: a straight delay and a variable tapped delay. The tap position is a percentage of the main delay time. This allows very short delays (<350μs) as well as long delays (750ms). Both tap position offset and main delay time are voltage-controlled over a -5v to +5v range. Feedback is jumper-selectable from either the tapped position or the main delay. This flexibility can generate standard rhythmic delays (feedback from main delay) or a series of pre-delay reflections (tapped delay) which sound very different from each other. Feedback Applies negative feedback (CCW) or positive feedback (CW). When placed in the center, there is zero feedback. 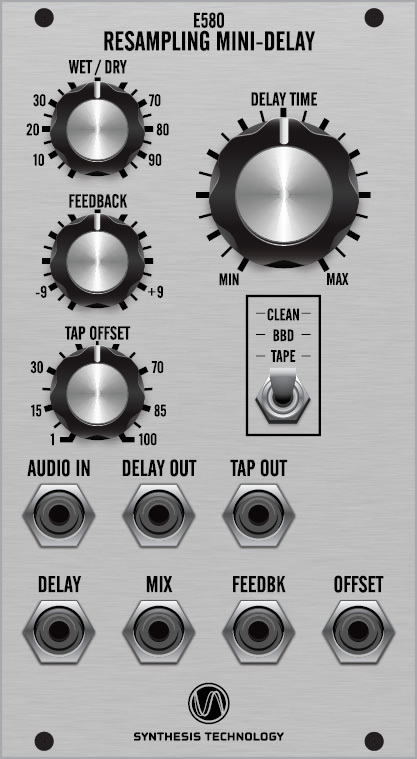 Tap Offset Sets the percentage of the Tap Out in relation to the Delay Time. For example, if the Delay Time is set to 100ms, the Tap is set from 0-100ms. The time resolution is very fine (over 7,000 independent positions) to allows very smooth modulation of the Tap position. Delay Time Sets the delay time for the Delay Out. Note that since Tap Out is a percentage of Delay Time, if you change the Delay Time there is a corresponding change to the Tap Out delay time. The time ratio of Delay to Tap is constant however.